Monty Woolley in a PR Photo for a 1949 production of The Man Who Came to Dinner. In many ways, Monty Woolley took over from Erich von Stroheim as the American version of "The Man You Love to Hate," becoming famous for his role as columnist Sheridan Whiteside in the play and film The Man Who Came to Dinner. The concept of the play and Woolley's performance immediately told the story: a dinner guest takes over the hosts' home and becoming a huge pest. Born into an affluent household, Woolley got his bachelor's degree at Yale University, where he and Cole Porter became lifelong friends. He took master's degrees at Yale and Harvard. He accepted a position as an assistant professor of English and drama coach at Yale. Woolley served in Paris with the U.S. Army during World War I.
Woolley made his Broadway debut directing the Cole Poerter musical Fifty Million Frenchmen during the 1929-1930 season. He remained on Broadway, directing shows or appearing in On Your Toes during the 1936-1937 season. In the meantime, Woolley got himself into a number of films out in Hollywood, where he would perfect his personna of waspish, high-octain, spouting in films like: Nothing Sacred (which played the Chinese in December, 1937), The Girl of the Golden West (played the Chinese in March, 1938), Young Dr. Kildare (played in November, 1938), Lord Jeff (played in July, 1938), and Midnight (released in March, 1939). In 1939, Woolley starred in the Kaufman and Hart play The Man Who Came to Dinner on Broadway, and was a sensation for 739 performances, running through July 1941. Woolley's considerable aura was perfect for the movies. He signed with 20th Century-Fox, and made his debut in the film of The Man Who Came to Dinner at Warner Bros. with Bette Davis playing the role of Whiteside's secretary. Released in January, 1942, the film is still an amazing portrait of the ultimate pain-in-the-neck invading a household. Other Woolley films include: The Pied Piper (which played the Chinese in September, 1942), and Life Begins at Eight-Thirty (played the Chinese in December, 1942). 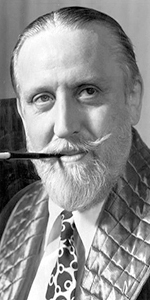 After the leg imprinting of Bette Grable in February, 1943, it was decided that for Monty Woolley's Forecourt ceremony, his famous beard would be stuck into a cement block held aloft by four burly men while being attended to by two young ladies — newcomer Jeanne Crain and the reigning Miss America, Jo-Carroll Dennison of Texas. The block was then lowered for the handprints and inscription. Woolley starred or co-starred in several films after this, including: Holy Matrinony (which played the Chinese in August, 1943), Since You Went Away (released in July, 1944), Molly and Me (played the Chinese in April, 1945), the highly fictional biopic / musical of his friend Cole Porter, Night and Day (released in August, 1946), The Bishop's Wife (released in February, 1947), As Young as You Feel (played the Chinese in June, 1951), and Kismet (released in December,1955). For a time afterwards, Woolley appeared on the radio, which was a good place for his singular voice, but health problems kept interferring. He passed away from kidney failure in 1963, at the age of 74. Grauman's Chinese Theatre, Hollywood, California. Monty Woolley Forecourt ceremony, Friday, May 28, 1943. Monty Woolley's beard is imprinted into a raised cement block with the help of actresses Jeanne Crain and Miss America for 1942, Jo-Carroll Dennison.